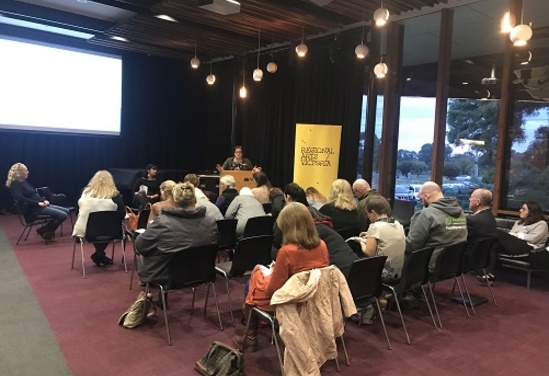 Regional Arts Victoria and Creative Victoria warmly invite you to attend arts funding information sessions in four regional locations across Victoria. Representatives from both organisations will be there to talk to you about funding opportunities, and to answer any questions that you might have. We will be visiting four regional locations from 18 - 21 June 2018. Tickets are free but bookings are requested. Light refreshments provided. Regional Arts Victoria would like to thank Shepparton Arts Theatre Group, Hothouse Theatre, Bright Art Gallery and Cultural Centre, The Delatite Hotel and the Gill from the Produce Store for their support with this event. Find out more about funding opportunities available to regional Victorians when representatives from Regional Arts Victoria and Creative Victoria head out on the road this June. Booking info: Tickets are free but bookings are requested.